Some revisions to the main file because of changes to the docks. Also fixed a couple of minor bugs. This is the merged Stirk file with all finished misc. quests. Untested, use at your own risk. Added some Colovian Barrow junk and Ayleid junk to relevant cells. Replaced chests in Colovian barrows with the new arks and coffers. Added two shrines: one on the very peak of the island, and a small one to the graveyard. The most important thing right now is to redo Wormusoel, the island's Ayleid dungeon, using the new assets (furniture, lights, misc. items, armor). The dungeon is rather lackluster right now, and could do with a bit of a revamp (especially since this is the first Ayleid dungeon many people are likely to see). We also need a lot more testing done. I'm not exactly sure what is needed here, the ruins seems close to properly equipped with all of these new Ayleid assets. But I can add a few more things. Not sure who made it. I've addd a couple of things to try them out myself, but hte majority of this ruin was built long before we had the Ayleid doors, chandeliers, items, etc. As a result, it's rather sparse. If you want to have a look at it, then by all means, go ahead. 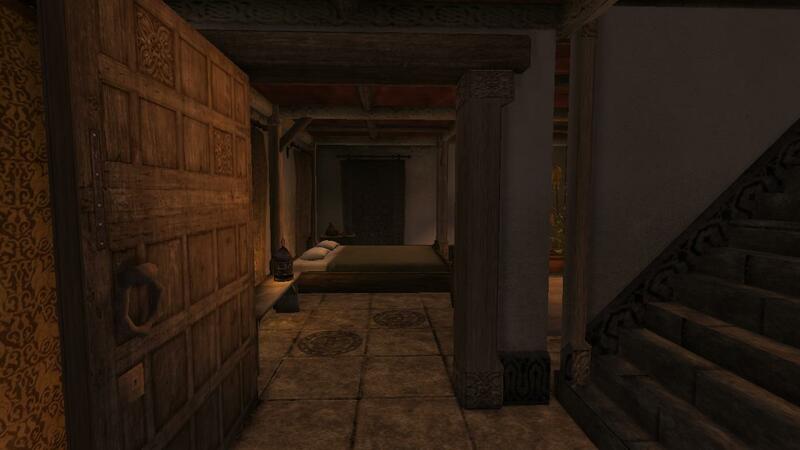 I should mention that there are two other cells involved: Wormusoel has a secret passage, and there is another Ayleid dungeon called Vabriasel somewhere out in the sea that could also be spruced up. Most importantly: All special greetings and any first time greeting given by npcs are currently overridden by one mentioning Victus Pilious favourably. See below screenshot. 3/28/2017 (13:54)	PC_Stirk_v4.2.ESP	3/28/2017 (10:55)	1	T_Bk_EpicOfTheGreyFalconPC	Helvor Family Crypt	-2128	1541	-417	"seems like an unfitting book for a colo-nordic family crypt"
3/28/2017 (14:15)	PC_Stirk_v4.2.ESP	3/28/2017 (10:55)	1	PC_Str_Josantha Maxim00000000	Stirk, Maxim: Smithy & Repairs	512	575	2	"npc sells vanilla heavy leather boots (50 AR)"
3/28/2017 (14:31)	PC_Stirk_v4.2.ESP	3/28/2017 (10:55)	1	com_chest_01_misc0600000000	Stirk Isle Region (-138,-51)	-1126327	-417454	273	"a vanilla chest (contained hound meat)"
3/28/2017 (14:31)	PC_Stirk_v4.2.ESP	3/28/2017 (10:55)	1	com_sack_02_thief	Stirk Isle Region (-138,-51)	-1126331	-417321	278	"a vanilla sack"
3/28/2017 (14:34)	Stirk Isle Region (-138,-50)	-1125230	-407888	2315	"very many feral donkeys here, seems a slight bit strange"
3/28/2017 (14:45)	PC_Stirk_v4.2.ESP	3/28/2017 (10:55)	1	T_CyrCom_Furn_Ch1MscGC	Stirk Isle Region (-138,-49)	-1122678	-400165	3209	"maybe there should be a bandit guarding the goods around here?" So far I have playtested the Helvor Legacy quest, at which I didn't notice any errors apart from missing quest-related greetings (probably due to the already-mentioned all-present greeting entry about Victus Pilious). The Atmospheric dictative quest works for the most part, except that Dandre Aurilie does not accept the inventory version of the welkynd stone for the completion of the quest (the filepatcher has translated all occurences to the lightsource version). also, picking a welkynd from the ruin will not make a journal message appear saying that you have found a needed welkynd stone. There are probably two places (dialogue action and loopscript) where you will have to adjust the id to the inventory version of the welkynd. 3/28/2017 (16:52)	PC_Stirk_v4.2.ESP	3/28/2017 (10:55)	1	PC_Str_Joclyn Clodius00000000	Stirk, Harbor Gate Pawnbrokers	1284	-1107	2	"again a trader selling vanilla heavy leather boots (50 AR)"
3/28/2017 (16:57)	PC_Stirk_v4.2.ESP	3/28/2017 (10:55)	1	PC_Str_ProcisPopillious00000000	Stirk, Lighthouse	5	531	-118	"the sharpened lens item is missing its model and still shows the moonstone icon"
3/28/2017 (17:00)	PC_Stirk_v4.2.ESP	3/28/2017 (10:55)	1	T_Ayl_DngRuin_I_EntranceSprl_01	Wormusoel, Unsullied Halls	6592	6400	14400	"the additional lightsources attached to pickable welkynds should be removed"
3/28/2017 (17:04)	PC_Stirk_v4.2.ESP	3/28/2017 (10:55)	1	T_Cyr_TerrRockGC_Rock_05	Stirk Isle Region (-135,-52)	-1101838	-418249	292	"a floating rock"
Hmm. I'm wondering what we should do about the leather boots. They're included because they are made of the same materials as the Colovian Fur Helm, but they're obviously in a different armor rank. Would it be okay to just make a copy of them called "Colovian Fur Boots" with more appropriate stats? Yes, that seems like a legitimate way of handling that problem. Those boots were apparently not meant to be used in the vanilla game, as they only show up ever once in a chargen character, afaik. Huh, I use those boots all the time. A T_ version would be great. On it. I can make color variations to go with the other Colovian helmets as well. Should provide some variety. The exterior door need to be relocated to match the interior door of the Snarleyohwl ship. New version with the above bugfixes included. Also slightly spruced up the Ayleid dungeons, and changed the names of the "Abecean Sea Region" and "Stirk Isle Region" cells to just "Abecean Sea" and "Stirk Isle". The changes to the Colovian Boots have been incorporated into the file for now, these will have to be ported over to data for the next update (along with a couple of other quick fixes in the Stirk file, such as the factions and some generic books). Alright, I playtested this for a bit and all of the errors pointed out above seem to be fixed. However there are still a couple of disfunctional things still. - selkies-rumour does not add the selkies topic to the npcs, the topic only shows up for all npcs when you have spoken to Quintus Tragia directly but it is already a relevant topic before you get to speak to Quintus directly. In the rumours you are pointed to that bard in the "Sloads Tale" to ask him about the topic already, but since the selkies-topic is not unlocked, you won't get any info from him. - More importantly the actual quest-topic is not unlocked when you speak to Quintus Tragia about Selkies, so the quest cannot be started altogether. The atmospheric dictative quest now works properly again. A small detail, which used to be fixed in leons questfile (it got overridden when merging the plugins, i assume), is that the door leading to the cellar garden is open by default currently, even if you receive a key from Dandre Aurilie after completed quest to open this particular door. It should be locked again and set to that key. Also: PC_Str_Durna00000000 Stirk Isle (-138,-49)	-1122830	-400168	3194	"npc has errormarkers attached. some of the references models don't seem to be in the data.bsa"
This is all I found so far. I played the golden amulet quest aswell and it worked out flawlessly at all paths I took. Edit: One last detail that I noticed is that there does not seem to be any rumours or otherwise dialogue pointing the player to the heirloom quest of the Helvors, so there is risk that people will overlook that particular quest entirely. Selkies topic should now unlock through rumors and the quest should start as normal. The door in Dandre Aurilie's house is now locked until the player receives the proper key. Durna (a bandit npc added after the last update) used colored Colovian Fur Gauntlets whose mesh paths were messed up (same problem as the silver helms in previous data). A simple fix, since the correct meshes are present in data. For now, the gauntlets have been removed. For the 'golden amulet' quest, I got the rumour that pointed me to the fisherman Kaya, so I went down to the docks to find him but it turned out he was in the town just wandering about. I don't know if you could add a hint to his location somewhere. I think there's someone in one of the taverns telling where he is. Yeah, I just found the guy who tells you where he is. Nevermind! 4/12/2017 (10:59)	PC_Stirk_v4.5.ESP	4/11/2017 (11:04)	T_Imp_SetStr_I_Wall_01	Stirk, Grain Storage	-376	902	0	"Black light used, very ugly"
4/12/2017 (11:04)	PC_Stirk_v4.5.ESP	4/11/2017 (11:04)	PC_Str_Corella Jacta00000000	Stirk, Corella Jacta's House	-118	286	-278	"hair bleeds into head"
4/12/2017 (11:10)	PC_Stirk_v4.5.ESP	4/11/2017 (11:04)	T_Imp_SetStr_DoorIn_02	Stirk, Pilious Manor, Right Wing	4288	4096	14784	"not touching end of doorjamb"
4/12/2017 (11:54)	PC_Stirk_v4.5.ESP	4/11/2017 (11:04)	T_Cyr_TerrRockGC_Rock_20	Wormusoel (-137,-49)	-1116904	-395418	1523	"caspers"
4/12/2017 (11:55)	PC_Stirk_v4.5.ESP	4/11/2017 (11:04)	T_Ayl_DngRuin_X_Bridge_01	Wormusoel (-137,-49)	-1119872	-397664	2928	"caspers"
4/12/2017 (12:00)	T_Com_UNI_PirateMap_02	Wormusoel, Unsullied Halls	-35	4293	12559	"don't use this TES:IV version of Tamriel, it got warped"
4/12/2017 (12:03)	PC_Stirk_v4.5.ESP	4/11/2017 (11:04)	T_Ayl_DngRuin_I_WelkyndClstG_01	Wormusoel, Unsullied Halls	2755	3277	14277	"is showing under pedestal"
4/12/2017 (12:04)	PC_Stirk_v4.5.ESP	4/11/2017 (11:04)	T_Ayl_DngRuin_I_WelkyndClstG_01	Wormusoel, Unsullied Halls	2755	3277	14277	"This ruin has no lamp cages on the sides of the walls"
4/12/2017 (12:11)	PC_Stirk_v4.5.ESP	4/11/2017 (11:04)	rock_adam_mold15	Kingfisher Cave	9728	3833	-591	"This being here is ok right? also, you may want to make an alternate version to fit in with your rocks"
4/12/2017 (12:12)	PC_Stirk_v4.5.ESP	4/11/2017 (11:04)	PC_m1-Stirk_dead_guard00000000	Kingfisher Cave	3961	2049	-381	"has 49 steel crossbows"
4/12/2017 (12:14)	PC_Stirk_v4.5.ESP	4/11/2017 (11:04)	T_Cyr_CaveGC_Door_01	Kingfisher Cave	449	1379	-41	"exterior and interior have 2 different door types"
4/12/2017 (12:16)	PC_Stirk_v4.5.ESP	4/11/2017 (11:04)	T_Imp_DngColBarrow_X_Entr_01	Stirk Isle (-136,-50)	-1106971	-402014	1429	"this door isn't built correctly"
4/12/2017 (12:18)	PC_Stirk_v4.5.ESP	4/11/2017 (11:04)	BM_KA_door_dark_02	Chaerraich Barrow	9095	3143	15625	"door origin far away from actual door"
4/12/2017 (12:19)	PC_Stirk_v4.5.ESP	4/11/2017 (11:04)	T_Imp_DngColBarrow_X_Entr_01	Stirk Isle (-138,-50)	-1124134	-408224	2768	"placement issues"
4/12/2017 (12:22)	PC_Stirk_v4.5.ESP	4/11/2017 (11:04)	T_Cyr_TerrRockGC_Rock_20	Stirk Isle (-139,-53)	-1133969	-433277	-1543	"these landsscape changes seem abrupt"
When testing, please make sure you are using the latest Project_Tamriel Data update! Floating objects or bugs may be due to missing assets. - Blood relic is not mentioned by Vilter nor the quest giver (Astoria Helvor) when the player is having it in it's inventory. -Dandre Aurilie completed the quest without the player having the sharpened lens. The Bonewolf, island it’s moored to, cove and wormsoeul secret passage -- All of these seem positively abandoned, yet the ship is in good repair. I'm assuming NPCs will be coming for these spots. Stirk, Arrest House - architecture misalignment as you go down the stairs. Cell doors appear offset from where they should be. Added pirate NPC's to the Bonewold and northern islands. There are two more basic things to fix. First is dialogue cleaning: merging the quest plugins has caused the Quest Greeting to end up at the bottom of the list. Not a real problem, since they are all sorted by ID, but not really good policy. Also there are one or two lines that need to be cleaned, and most vanilla-topic dialogue should be placed between existing lines to avoid issues (currently, most of it is placed at the very top of the list). Most of this is not absolutely essential, since most dialogue works right now, but good policy for the future. Second problem are the travel scripts. Currently, the script that needs to move the player from Ebonheart to Stirk does not work. I'm no genius when it comes to scripts, so I would appreciate it if someone could have a look at that. This update only contains the .esp file. Make sure to load this up along with the data files form the previous update!